This Nutella chocolate cake has three layers of rich chocolate cake stuffed with Nutella and decorated with Nutella cream cheese frosting, dark chocolate ganache, and chocolate hazelnut truffles. The holiday season is in full swing, and that means plenty of parties and family get-togethers to bake for! I just love getting to share all sorts of festive and indulgent desserts with friends and family during this time of year. It seems like an especially appropriate time to share my Nutella chocolate cake recipe with you! This cake has been one of my go-to celebratory cakes for a while now. The first time I made it was to celebrate my husband’s birthday. I was new to baking layer cakes at the time, but I was determined to bake something ambitious and impressive and worthy of a very special occasion. In the end, the cake layers ended up being super crumbly and one of them even split right down the middle!! It was a miracle my cake was standing in the end (the trick was lots of frosting and Nutella to glue it all together). But despite all that, we still totally enjoyed the cake anyway. Nutella is a beautiful thing, my friend. A month later, my mom requested a similar cake for her birthday as well (she loves chocolate and hazelnut), and I was able to make some adjustments and improvements to the original recipe. Since then, I’ve continued to experiment with this combination of chocolate cake, Nutella, and chocolate hazelnut truffles. And I think this final version is to die for! In fact, this Nutella chocolate cake is one of the most decadent cakes I’ve ever made. And that’s saying something! The cake itself is rich and chocolatey and moist (just as it should be!) and between each layer is a filling of pure Nutella. Which is, in my opinion, one of the absolute best ways to fill a cake. Check out my Triple Berry Nutella cake recipe if you’re interested in more cakes with Nutella filling! Throughout my recipe testing process, I sampled a few different types of frosting with this cake. They were all delicious, but the recipe that won over my heart was this Nutella cream cheese frosting. It’s smooth and wonderfully rich (of course), but the cream cheese also helps provide a little contrast to all the chocolate in the cake. Most recently, I sent this Nutella chocolate cake along with my husband to his semiweekly Dungeons and Dragons game night. Ahh, I know, he’s so nerdy, but I love him anyway! Ben texted me from game night to let me know that they all loved the cake. Apparently, it was the perfect fuel for “fighting werewolves” (lol). If you make this recipe, tag @flourcoveredapron on Instagram so I can see all your beautiful creations! I loved seeing some cranberry apple cakes and pumpkin apple cupcakes from Thanksgiving! Check out my guide to the essential tools for cake baking and decorating for more helpful tools for mastering this recipe! 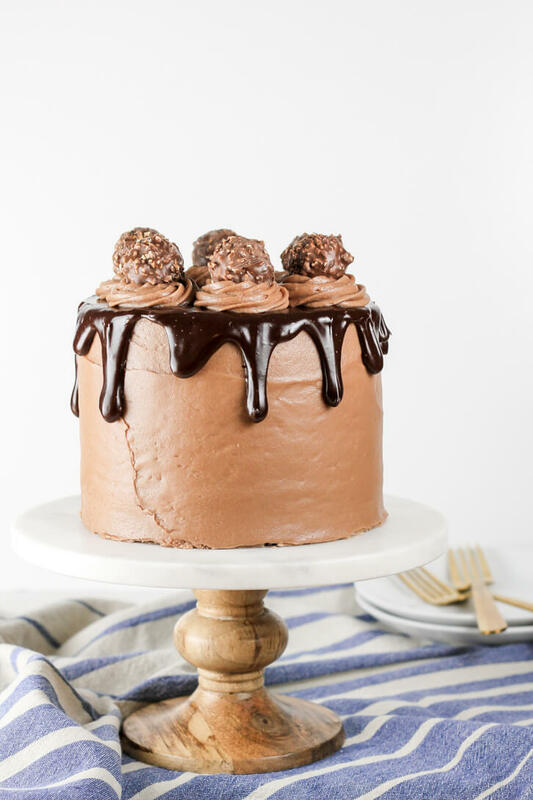 A decadent dessert with three layers of rich chocolate cake with Nutella filling, Nutella cream cheese frosting, dark chocolate ganache, and chocolate hazelnut truffles. Preheat oven to 315 degrees Fahrenheit and prepare three six-inch cake pans by lining the bottoms with parchment paper. Then, grease and flour the pans. In a medium size bowl, whisk together the flour, cocoa powder, espresso powder, baking powder, baking soda, and salt. Set aside. In the bowl of a stand mixer (or a large bowl with a hand mixer), beat together both sugars and the oil until well incorporated. Add vanilla extract, then the eggs and egg yolk one at a time. With the mixer on low speed, alternate adding 1/3 of the flour mixture and 1/2 of the buttermilk, starting and ending with the flour and mixing until incorporated after each addition. You will have three additions of flour and two additions of milk. Add hot water and fold into batter by hand with a spatula or wooden spoon. Divide batter evenly between three prepared cake pans. Tap pans gently on the counter to remove excess air bubbles. Bake at 315 degrees for 37-40 minutes, or until a toothpick inserted into the center of the cake comes out with just a few moist crumbs attached. Let cakes cool in pans for 5-10 minutes, then turn out onto a wire rack and let cool completely. Using an electric mixer, beat together the butter and cream cheese on medium speed until light and fluffy. And the Nutella and beat until well combined. With the mixer on low-speed, add the powdered sugar gradually (about 1 cup at a time), mixing until incorporated after each addition. Then, increase speed to medium-high and beat until smooth. Fit a piping bag with a large round tip and fill with some of the frosting. Once cakes are completely cool, use a serrated knife to slice off the tops of each layer, to create a completely level layer. Place bottom layer on a cake board, using a small amount of buttercream to secure. Pipe a dam (or a ring) of frosting around the outer edge of the cake (this will keep the Nutella inside). Then, fill in the middle with about 1/4 cup of the Nutella** and spread evenly with an offset spatula. Top with second layer and repeat this step, finishing by topping with the third layer (cut side down). Frost the top and sides of the cake with a very thin layer of frosting (a crumb coat) to lock in the crumbs and even out the sides. Chill cake for at least 20 minutes. Reserve 1/2 or 3/4 of a cup of frosting (for piping on top), then use what's left to finish frosting the cake completely. Chill cake again for about 20 minutes. Meanwhile, make the chocolate ganache. Place chocolate chips in a heatproof bowl. Heat the heavy whipping cream in a small saucepan on medium-low heat until the cream is heated through and small bubbles begin to form around the edges. Pour cream over the chocolate chips and let stand for 5 minutes. Then, whisk until smooth and let cool for a few minutes. Ganache should slowly, but fluidly drip off a spoon for the correct consistency. Remove cake from fridge and spoon the ganache around the edges of the cake, pushing it over the edges to drip down the sides of the cake as desired. Smooth the top with the back of a spoon or an offset spatula. Using a large, closed star piping tip, pipe swirls around the outer edge of the cake and top each swirl with a chocolate hazelnut truffle. *substitute 1/2 cup milk with a teaspoon and a half of lemon juice OR white vinegar for buttermilk. Stir together and let sit for 5 minutes before using. **If Nutella is too firm to spread evenly on your cake, put the Nutella in the microwave for 10 seconds at a time until it is spreadable. This recipe is inspired by The Kitchen McCabe. First off….this cake you have created is a piece of art! I would almost be afraid to eat it because it is so beautiful! seriously, this is amazing in everyway, this is beyond impressive! I knew I was going to fall in love with this recipe the moment I saw how many times Nutella was in the title. Cannot get over how perfect this is! Haha! The more Nutella the better, I say! Thanks Karly, I hope you get a chance to try it! This cake looks absolutely stunning!!! Hi Rebecca, I use standard size measuring cups, which you can purchase online or at any store that sells bake or cookware. To measure dry ingredients, I recommend spooning the ingredients into the cup and then leveling with a knife. Hi Beck, not silly at all! Given the cream cheese in the frosting, I do recommend storing this cake in the fridge. You can remove it an hour or two before serving to let it come back to room temperature. If you’ve sliced into the cake, you can press a piece of plastic wrap against the cut edges to keep it moist!